By The Raveonettes.. And no, do not worry, I am not contemplating my title! I just loooooove this song!!! I was catching up on all the episodes of Gossip Girl I missed.. And this song was played for a bit at the beginning of 'The Debarted' episode. It took me quite awhile to find, but I also stumbled across this awesome website that lists songs from TV shows/Commercials/Movies/Etc.. Pretty awesome! Anyways, check it out, I think it is amazing! It drops the b-bomb near the beginning, but they allow that word on TV now anyways, so it should be ok! Just some sub-par photos for all of you. I liked my first nails, they were inspired by the ever popular Illamasqua nails, you know the mani I am talking about! I used CG Heli-Yum, OPI Elephantastic Pink & CG Liquid Leather. 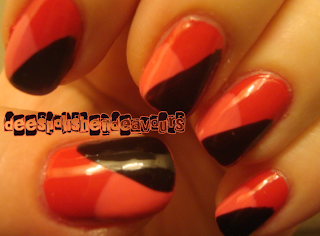 I really liked the colour combo, minus the fact it reminded me of Valentine's Day - lots of compliments on it though. Super easy to do! Now on to my MultiColoured Fail! The photo that I saw of this looked so cute.. The only thing I liked about it was the glitter polish on white.. I didn't bother cleaning up because my clean up was taking it off. I just posted this photo to show how badly I faiiiiled!! After that disastrous attempt, I went out shopping for a bit.. 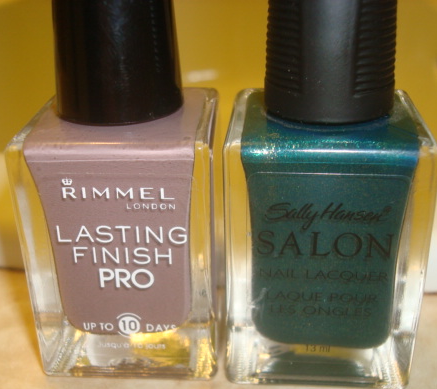 I ended up grabbing the last bottle of Rimmel Steel Grey & SH ProjectRunway on sale! Woo! Well, that is all for now! I hope everyone has a terrific Thursday!! Talk to you soon. Tierney - Thaaank you! You totally should give it a whirl, it is actually quite fun and I like how they all match yet are all so different! gildedangel - Thankies doll - It was something new to try and I am glad the results weren't horribly bad! LOVE the first picture you posted! That looks really fun. 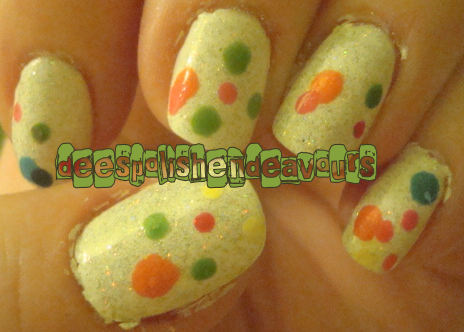 I also think those polka dots look kinda cool!